It's an all too common ritual: A product in the kitchen passes its "best before" date, so you toss it. Trouble is, it was probably perfectly safe to eat — and you just wasted good food. This is a problem that's only getting worse. Here's what you need to know about "expired" foods — and how to make sure you're eating safely. Because most of us no longer live on farms, we're utterly dependant on others to provide our food for us. We're now divorced from the manufacturing process, so manufacturers have to tell us when their products are fresh and when they're no longer good to eat. This has led to a spate of labelling systems, and not all of them mean the same thing. Nor are they necessarily directed at the consumer. What's more, they're not centrally regulated or coordinated in any coherent way. For example, products can have "Best Before" dates, "Sell By" dates, and "Use By" dates — and it's not always clear who these dates are being directed to, or what information is being conveyed. Making matters even more confusing is the surprising revelation that expiration dates are not an indication of how safe the food is to eat. They're not related to the risk of food poisoning or the presence of foodborne illnesses. That, dear consumer, is something you need to watch out for. Rather, expiration labels are an indication of a product's freshness. It's a labeling standard used by food manufacturers to convey to stores and consumers when their products are no longer at peak freshness. Foods that are on the wrong side of their expiry dates are not necessarily inedible — it simply means that beyond this date, the manufacturer cannot guarantee the standard of their brand's quality, including attributes like taste, color, texture, and so on. Simply put, those "sell by" dates are there to protect the reputation of the manufacturer. Best before dates in the United States are not mandated by law. Except in one important case, however — infant formula. For this special category of food, calendar dates must be expressed in both month and day of the month. It must also contain an unambiguous explanation, such as "sell by" or "use before." The only other exception is for milk or meat, where some jurisdictions are required to provide sell-by dates. As noted, the state of food labelling is a bit of a mess today. Last year, a scathing report by the Natural Resources Defense Council (NRDC) and Harvard Law showed that more than 90% of Americans may be prematurely throwing away food because they misinterpret food labels as indicators of food safety. A previous report by the NRDC revealed that Americans toss up to 40% of the food supply every year, equivalent to $165 billion. The same problem exists in Europe; a recent commission discovered that up to 100 million tons of food are wasted in Europe each year — and this waste often happens because of poor understanding of best before and use by dates. Clearly, the labeling rules need to change (we'll get into this in just a bit), but until that happens here's what you need to know. Sell-By: This date tells the store how long to display the product for sale. 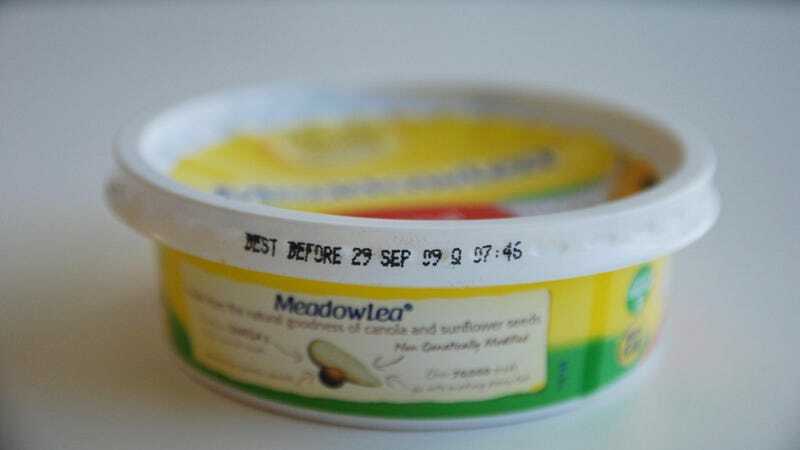 Consumers should buy the product before this date expires. Best if Used By (or Before): This date indicates when a product maintains best flavor and quality, but it's not a purchase or safety date. Use-By: This is the last date recommended for the use of the product while at peak quality. These dates are determined by the manufacturer of the product. Closed or Coded Dates: These are packing numbers for use by the manufacturer, and are typically indecipherable to the end consumer. Where Do These Dates Even Come From? In order to determine when a product is no longer up to snuff, manufacturers recruit experts to tell them. One such expert firm is the National Food Lab located in Livermore, California. This company takes food and leaves it on shelves for days, weeks, and even years to see how it holds up. Then, at controlled intervals, the food is presented to a highly trained panel of experts who assess the food for taste, smell, and texture. They then assign a food grade in numbers; the lower the number, the poorer the quality. Needless to say, the numbers go down as the food gets older. Food manufacturers consider these numbers when determining best-before dates. So, if a product was designed to be a 7 when it was fresh, but gets a 6.2 after a certain length of time, the manufacturer can draw the line at that point. Interestingly, many foods that are assessed at lower values still taste good — and are safe to eat — it's just that the manufacturer is no longer satisfied with the level of quality. According to [John] Ruff, most products are safe to eat long after their expiration date. In fact, even meat or milk that's clearly starting to spoil is not necessarily dangerous. "Very often, you won't eat it because of the smell, and you probably won't like the taste, but in a lot of cases, it's unlikely to cause you illness," he says. That's because it's not the food that sat on the shelf too long that makes you sick, Ruff says. It's the food that got contaminated with salmonella or listeria bacteria, or disease-causing strains of E. coli. And that food might not smell bad as it might have arrived in the store only yesterday. Canned food in particular has an exceedingly long shelf life. As noted in the NPR article, canned corn from 1934 still looked and smelled the same when opened in 1974. It had most of the usual compliments of nutrients, though there were lower levels of vitamin C and others. If a product has a "use-by" date, you should follow that date. False Notions that Food is Unsafe: 91 percent of consumers occasionally throw food away based on the "sell by" date out of a mistaken concern for food safety even though none of the date labels actually indicate food is unsafe to eat. Consumer Confusion Costs: an estimated 20 percent of food wasted in U.K. households is due to misinterpretation of date labels. Extending the same estimate to the U.S., the average household of four is losing $275-455 per year on food needlessly trashed. Mass Amounts of Wasted Food: The labeling system is one factor leading to an estimated 160 billion pounds of food trashed in the U.S. every year, making food waste the single largest contributor of solid waste in the nation's landfills. 3. Increase the use of safe handling instructions and "smart labels"
It could be a while — if ever — before we see such common sense changes put into place. Alternately, and as is being proposed in Europe, products with a very long shelf life could simply be made exempt from best before labels.